The good part: No white background! Instead we get a brown kitchen background. Which I honestly believe to be a step up. The bad part: Catherine Zeta-Jones look awfully chirpy for someone who recently lost her sister, unexpectedly has to take care of her niece and is forced to accept working with Aaron Eckhart by her boss. See, the movie, which is a remake of the German Mostly Martha, is about an uptight chef who has her life turned upside down. Eventually she will loosen up and fall in love with the Eckhart character, but that is towards the end of the movie. This poster makes the relationship between the two characters seem easy going and fun, which is a bad misrepresentation of the film’s premise. As a matter of fact, just having this two characters in equal footing and alone in the poster is already a misrepresentation. The main character is the Zeta-Jones one, by far. And the aforementioned niece is just as important to the story as the Aaron Eckhart character, if not more. The poster makes this look like a typical romantic comedy set in a kitchen, and it’s not, or at least it is not supposed to be. The promotion for this movie is giving me a bad vibe. It make the film seem like a watered down version of the original, and the original was itself pretty light. Not good. 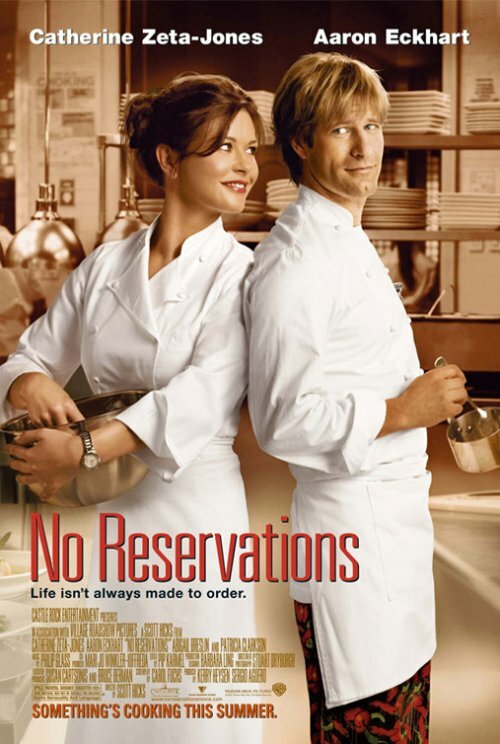 Related: the No Reservations trailer.